When we moved into our home over 4 years ago, we started out with nothing. We had to buy all of the furniture, wall decor and knick knacks that make a home feel like “home”. Over the years, we’ve gotten each of the rooms pretty much to where we want, but we still have the one “forgotten” room that isn’t quite done yet. We’ve managed to put paint on the walls and while I love the color, the room needs a lot of work to get it to where I envision it. My husband and I finally decided now that the rest of our house is decorated to our liking now its finally time to start in on our living room! Mission – Find flooring that can stand up to pets and kids! I reached out to Pergo and discovered that they have a new line of flooring, Pergo XP that is available exclusively at the The Home Depot and I am beyond thrilled with the opportunity to partner with them to put the new Pergo XP line to the test in our home! The Pergo XP collection is extremely durable, pet-friendly scratch-resistant flooring. So durable in fact, it comes backed with a lifetime residential warranty and is guaranteed to stand up to the toughest messes and the biggest dogs. Perfect for us! It has a PermaMax Scratch Guard Protection layer that is made to protect your flooring from the scrapes and scratches a dog usually leaves on floors. Yet another “Pro” on our list of potential flooring candidates. Prior to making our decision to go with Pergo, we had taken samples home from many other brands and the pieces were so difficult to attach to one another you would have pulled all your hair out by the time you actually finished your project. Not to mention without naming brands they just looked cheap. When we go to spend our hard earned money knowing what this floor will be put through we expect the best, plain and simple. If a room takes months to finish- so be it. It’s going to be exactly how we want it using quality materials we demand so we’re not replacing things time and time again, If its worth doing it’s worth doing right. We’re going to be installing the flooring ourselves to help cut costs so I was happy to hear about the perfect fold Pergo XP features so each piece will fit easily and snug with the next one which should make installing it pretty simple. In addition, we won’t have to put an underlayment down first because the Pergo XP line comes with an attached underlayment – great, one less step! Twenty-five décors offer authentic wood grain and tile finishes, all reflecting the most popular trends in home design. Provides double the wear, double the durability of ordinary residential laminates** plus ScratchGuard Advanced for 30% greater scratch protection. Ideal for do-it-yourselfers who want to improve the look of their home in just a weekend, Pergo XP features Pergo Perfectfold™ joint technology for easier and more secure installation. For faster installation and maximum sound reduction. Pergo XP offers the added confidence and protection of a limited lifetime residential warranty against wear, fading and stain. With proper installation and simple maintenance, your floor will stay just as beautiful as the day it was installed. In fact, the commercially-rated Pergo XP provides such superior durability that it’s also backed by a five-year light commercial warranty for ultimate peace-of-mind. 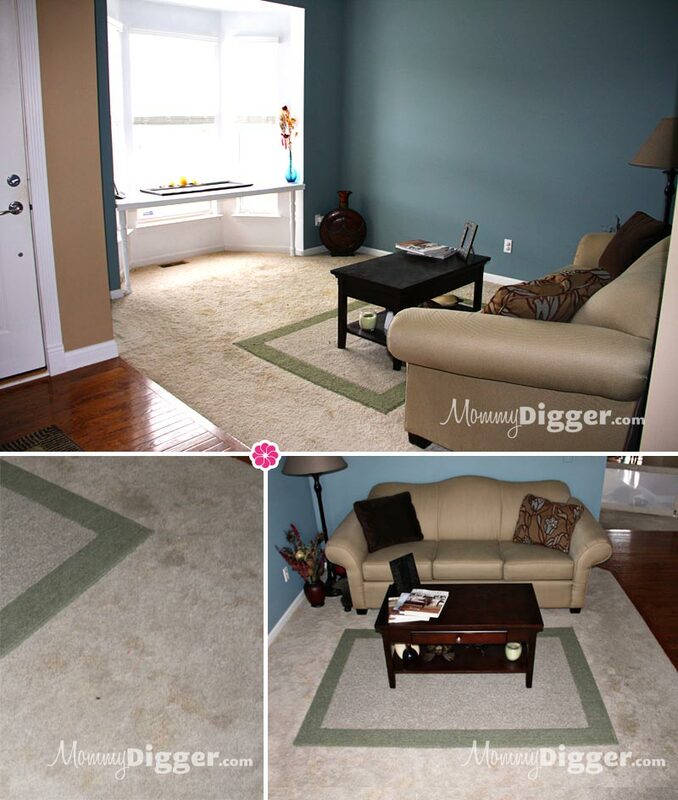 We can’t wait to start our living room renovation and are happy to have found Pergo XP flooring. We’ll finally have a living room that we can be proud of and one that can stand up to the daily wear and tear of a family with pets – I can hardly contain myself!! I’m so excited to share our experience and progress with all of you over the next few weeks! Next, we’ll be deciding what color and style we’d like, so stay tuned! I’d love if you would share any tips or your personal Pergo flooring project experiences with me! Disclosure: Pergo provided the flooring for our living room renovation project and I can’t thank them enough. All thoughts and opinions are based only on my experiences with the product. Thanks for reading my “Are you a Mommy Master” post. Now following your blog. Sounds like you found exactly what you needed. We have been redecorating our playroom for a while…trying to make it work for our kids but also look good for us. We have wood floors and a large dog, but so far, it’s held up. In our other house, the wood floors were destroyed. Thanks for the info-good to know!!! This is fantastic! I just saw this in my local Home Depot the other day too!! PLEASE get this installed so I can see & read the review on your experience with it! We’ve been pondering a few choices but now that my husband and I came across this- and now your blog post we are pretty much sold on this new line their carrying. Will check back often on progress!!! P.S- GREAT write up! We have a similar family and boy do our floors take a beating, how nice would it be to have a beautiful floor like this and not see it hacked to pieces in a year!! I love your reviews and this one looks like its going to be a superb one. Can’t wait to see what colors you and your husband picked for the room in the pictures. Looking forward to reading more as the weeks go by! The Pergo flooring in that picture looks amazing! It is beautiful. Also, from your review, it sounds like it should be an easy to do it yourself project! I cannot wait to follow you through the installation and see if this looks like something my hubby and I could do for our living room at home. Can’t wait to see the finished product! I have heard fantastic things about Pergo! Great review Brynn! We are in the middle of renovating our living room right now & are looking at har wood options.. This is helpful! I love Pergo flooring. I love your living room by the way, you really are great at home decor. It is an interesting shaped room, it leads to the front door and is attached to the foyer/hallway. We’re going to be using Pergo throughout, it used to be hardwood and carpet which makes the room seem smaller. By using the same flooring the area should seem a bit bigger. The floors look great! We need something that holds up to kids and pets too and will definitely check them out! We are getting ready ti redo our floors! looking forward to seeing the final outcome…my son has pergo flooring & loves it! I am considering Pergo XP in highland hickory. Love that it doesn’t look like your typical, plastic cheap laminate. I think it looks like real wood, with all the graining. Not sure if I really want all the graining though, it seems so rustic and country to me. My house is decorated more with more modern and espresso colored furniture. So hard to decide! Sounds like great flooring! We have 7 dogs and a cat,so I’m also looking for hardwood floors that can hold up to all the things they do to ruin it. These sound extremely durable. We are considering Pergo XP on our second floor master bedroom suite and hallway. How is the “sound” of the Pergo XP? Does it sound “hollow” like the Pergo floors of yore when walked on with dress shoes or smacked with kids toys, dog paws? I wonder if the built-in underlayment makes it as quiet as glue-down hardwood floors when it’s walked on with shoes or the dog claws on it? We picked up some free color/wood samples at Home Depot, and the Pergo XP in “Grand Oak” matches our real oak floors on the main level. Thanks for helping us decide! It doesn’t sound hollow but you can tell the difference between when our dog is walking on the Pergo XP compared to our hardwood. It also doesn’t have any squeaks or creaks like our hardwood tends to get. I really love our flooring and would definitely recommend it. It’s worth the investment because it really does last! after you’ve had the pergo xp highgland hickory in for a bit , can you tell how it is for cleaning? i have narrowed our flooring selection down to the highland hickory but the beveled/ routered groove where the planks meet worries me that it will get built up with crud and wont clean well. also how is the shine? shooting for a lower reflective shine across hoping it doesnt show foot print smudges as well as smooth laminate. We actually went with the Hand Sawn Oak, it does have a worn look to it and I’ve not had any issues cleaning where the planks meet. Our dog even had a dirreah issue on our Pergo floor and I was able to clean it up even where the flooring planks meet without any problems. It doesn’t have a lot of shine just a light sheen that makes it look new and clean but doesn’t show all of our walking smudges. We have regular hardwood still in our kitchen and our Pergo in the living room and entrance is much easier to keep clean and stays looking clean in between our biweekly (sometimes longer) cleanings.